This new study may come both as a shock and at the same time as not so a surprise: when evaluating the same black student, white teachers expect significantly less academic success than black teachers. Even more: this is especially true for black boys. When a black teacher and a white teacher evaluate the same black student, the white teacher is about 30 percent less likely to predict the student will complete a four-year college degree, the study found. White teachers are also 12 percent less likely to expect their black students will graduate high school. The study, forthcoming in the journal Economics of Education Review, and now available online, suggests that the more modest expectations of some teachers could become self-fulfilling prophecies. These low expectations could affect the performance of students, particularly disadvantaged ones who lack access to role models who could counteract a teacher’s low expectations, Papageorge said. The findings also likely apply beyond the education system, the researchers say — leading to racial biases in the workplace, the service industry and the criminal justice system. The researchers analyzed data from the Educational Longitudinal Study of 2002, an ongoing study following 8,400 10th grade public school students. That survey asked two different teachers, who each taught a particular student in either math or reading, to predict how far that one student would go in school. With white students, the ratings from both teachers tended to be the same. But with black students, boys in particular, there were big differences — the white teachers had much lower expectations than black teachers for how far the black students would go in school. Black female teachers are significantly more optimistic about the ability of black boys to complete high school than teachers of any other demographic group. 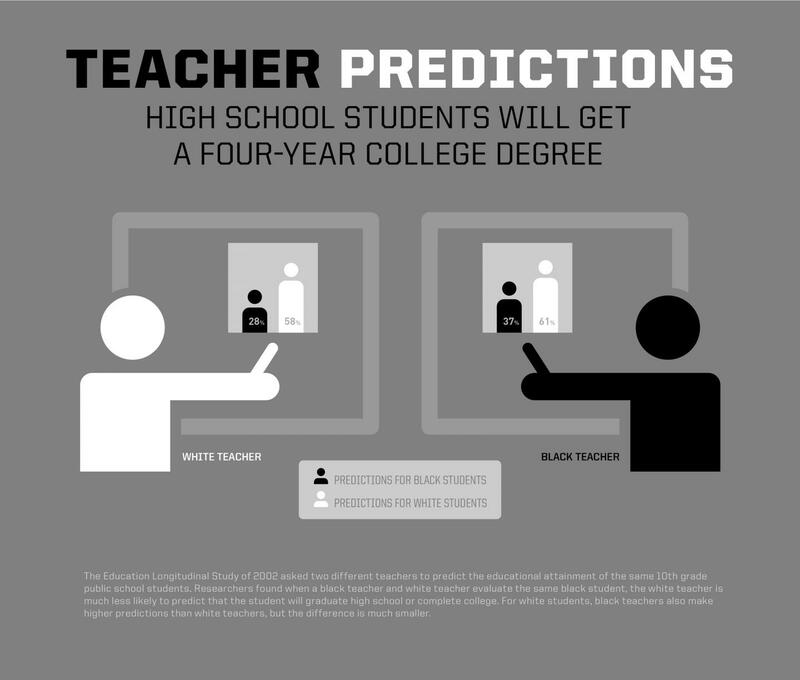 They were 20 percent less likely than white teachers to predict their student wouldn’t graduate high school, and 30 percent less likely to say that then black male teachers. Papageorge’s co-authors are Seth Gershenson, an assistant professor of public policy at American University, and Stephen B. Holt, a doctoral student at American University. Teachers are an important source of information for traditionally disadvantaged students. However, little is known about how teachers form expectations and whether they are systematically biased. We investigate whether student–teacher demographic mismatch affects high school teachers’ expectations for students’ educational attainment. Using a student fixed effects strategy that exploits expectations data from two teachers per student, we find that non-black teachers of black students have significantly lower expectations than do black teachers. These effects are larger for black male students and math teachers. Our findings add to a growing literature on the role of limited information in perpetuating educational attainment gaps.